After the excesses of Christmas, the traditional January purge kicks off in earnest. 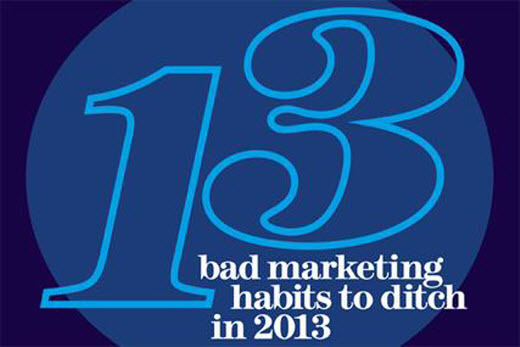 Nicola Kemp picks 13 common bad habits that marketers should forgo this year. Marketing is littered with cautionary tales of an entrepreneurial upstart brand revolutionising established business practices. Take the advent of Netflix and decline of Blockbuster, for example; if it taught us anything, it is that the desire to protect or adapt an existing business model rather than embrace the digital ecosystem is quite simply brand suicide. This curse of marginal thinking is perhaps the biggest barrier to business success in the modern era. Even now, many brands are still dragging their heels when it comes to adapting to the proliferation of digital. In Velocity: The Seven New Laws for a World Gone Digital, Ajaz Ahmed writes that one of the reasons why established organisations struggle to innovate is that the existing team already has its hands full doing its current job. Big organisations are usually built for efficiency, not innovation. In his latest book How will you Measure your Life? Clayton M Christensen, professor of business administration at Harvard Business School, says that every time an executive in an established company needs to make an investment decision, there are two choices on the menu. Indeed, one of the big themes to have emerged in 2012 among many marketers was that of frustration. Without a high degree of autonomy, marketers cannot move fast enough to keep up with the sheer pace of change and innovation in the marketplace. In Adapt: Why Success Always Starts with Failure, economist Tim Harford writes that many corporations today have the right level of centralisation for an era dominated by logistics and scale, but too much for an era dominated by innovation and creativity. This is particularly true in marketing, where the advent of global network and brand deals have denied local markets the ability to engage with local suppliers to drive fast and adaptive innovation. Compare and contrast this approach with that of Google, where engineers are allowed to spend one-fifth of their time on their own projects. If the recession has left many marketers trapped in a mire of marginal thinking, then 2013 must be the year the industry finally embraces change; otherwise, it risks following Blockbuster down the path of irrelevance.